ACO ShowerDrain design meets perfect functionality. Well known for its high-quality shower drainage products and exceptional customer care, ACO strives to create beautiful and timeless projects. Endless possibilities to make design dreams come true. 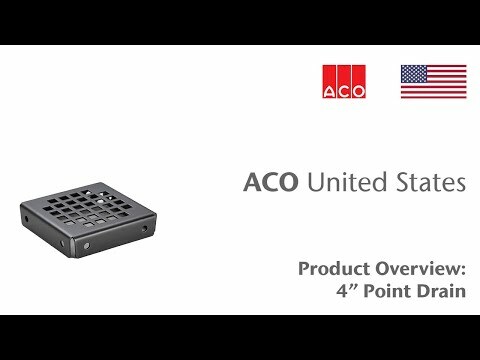 The ACO Showerdrain Tile Point Drain is easy to install and designed to last. It's square design and convenient all-included package makes completing your shower and bathroom quick and simple. The ACO Showerdrain barrier-free drains allow the drain to become part of the design. It eliminates barriers in the shower making it ADA friendly while allowing for a sophisticated design. The linear shower drains eliminate unnecessary sloping, are easy to install and built to last. ACO Showerdrain grates are made of electro-polished stainless steel. Made and Packaged in US.